The Sunday Times today published a preview for every single Premier League Club ahead of the 2015/16 season. And it's fair to say, the Newcastle United entry has got twitter talking. In spite of each entry only taking 10x5cm on the broadsheet format, the journalist managed to squeeze in as many underhand digs at Newcastle he possibly could. Under the “Prospects” section, the unnamed journalist begins: “Last year’s near disaster was hardly unforeseen, but it’s hard to imagine better must come [sic]”. He moves swiftly onto transfers: “The new signings inspire little confidence and last year’s under-achievers remain. Unlike cancer-survivor Jonas Gutierrez, who scored and made the goals which kept Newcastle up in last season’s final”. Clearly the said journalist has watched very little Dutch and Belgian football in the past. Though one might argue we haven’t yet brought in enough new talent this summer, this is the first time I have actually seen someone criticize the calibre of the players already in; Wijnaldum, Mitrovic and Mbemba have all been lauded as among the most exciting imports Newcastle fans have seen for years. So, for some outsider to state otherwise, with such unwarranted certainty, is bewildering. How often have we seen tabloids supporting the sorry cause of Alan Pardew, a man who was supposedly isolated unfairly by the fans the moment he stepped into St. James’ Park. That is not the case at all. Pardew was given a fair chance at Newcastle (4 years and 22 days, in fact) before he fluffed it. When he did well (and there’s no doubting he did at times), we congratulated him. But his insufferable personality got the better of him, and eventually he fell victim to his own ego (and questionable tactical preferences). For the Sunday Times to slap such a redundant, uninformed remark into their season preview for us, is very disappointing, and something which only serves to reinforce and justify the animosity many Newcastle fans have towards national journalists. It’s pure ignorance. Davide Santon…? The man who left Newcastle to sign for Inter Milan last January…? The man who, since leaving Newcastle, has only gone on to make 9 appearances for Inter? Yes, that Davide Santon. Drivel. The only thing that this journalist did get right in the entire preview is Newcastle’s “Weakest Link”: Mike Williamson. But, at the end of the day, my gran could have worked that out if she were to submit herself to any of Newcastle’s games over the past 18 months. And she’s blind. Unexpectedly, in keeping with the verbal assault above, he finishes the article with a season prediction of 16th, below the likes of West Brom (12th), Sunderland (14th) and Palace (11th). Bournemouth, however, are for some reason predicted 16th as well – obviously can’t make his mind up who he hates more. It is massively disappointing to see such a thorough dissembling of Newcastle positivity. It is by no means a reflection of the fans’ mentality (and the pessimism normally arises from our very own stands), and is complete with a number of factual errors. @StephNUFC @thespectoview somebody who works for The Sunday Times, not The Times. @StephNUFC@thespectoview if Paul Dummett is the man of the season, NUFC will have been relegated. It is not clear who wrote the article but it is an absolute disgrace. And the fact he says Amolfitano has just left….although he went 2 seasons ago, just undermines any shred of credibility..
Well said,Harry. You did a better job of it than that idiot from The Times. His comments and opinions are so ignorant they are not worth commenting on. The Spectator s View @thespectoview. 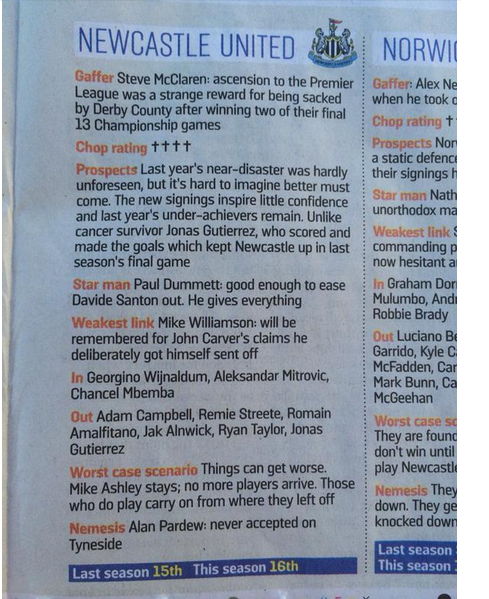 The Sunday Times Publish Shocking Season Preview for Newcastle United .